Have you ever found yourself frustrated by buffering internet because of a weak Wi-Fi signal, while you are relaxing in your backyard or in a pool? Don’t worry. 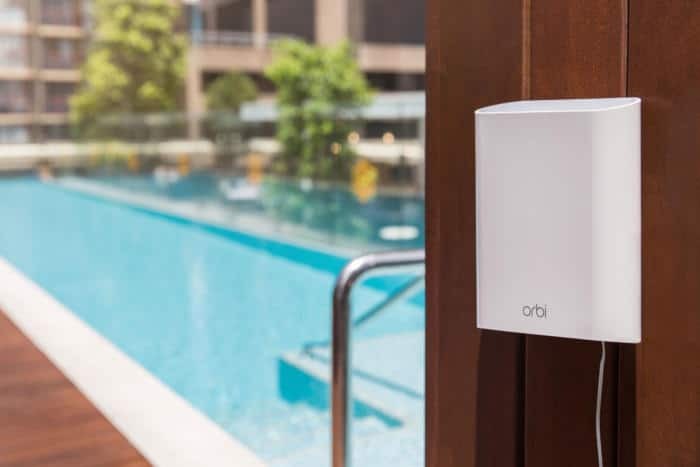 Netgear has come up with an outdoor router called the ‘Orbi Outdoor Satellite’ so that you can happily stay connected both in and around the home. As its name suggests the basic idea of the Orbi Outdoor Satellite is to extend your Wi-Fi network beyond the house. Netgear says a single Outdoor Satellite extends the range of your Orbi network by another 2,500 square feet. The device, designed for both home and commercial deployment, requires an existing Orbi Home Wi-Fi system, or the Orbi Pro Tri-Band Wi-Fi System for Small Businesses to work. If your yard is rather big, multiple Orbi Outdoor Satellites can be used to expand coverage. The new Orbi has the same capabilities as Orbi’s Whole Home Wi-Fi System, including a single network name, a dedicated channel for data exchange between the satellite and main router, and a separate guest Wi-Fi network. It also features guest and employee traffic separation and a separate admin network if you need it. Since it’s designed to live outdoors, the Orbi Outdoor Satellites are built as weather-resistant (including resistance to dust, water, and sub-zero temperatures). Netgear says the device can stand on its own or be mounted on a wall. They also have an ambient night light, which you can schedule to have the device switch on or off. Designed for both home and commercial deployment, the pricey device is available now with an MSRP of $329.99.